People commonly believe that it is good to breathe or inhale more air at rest. However, this makes the breather breathless due to anaerobic respiration in cells. Breathing correctly 24/7 is an art that is very rare these days. 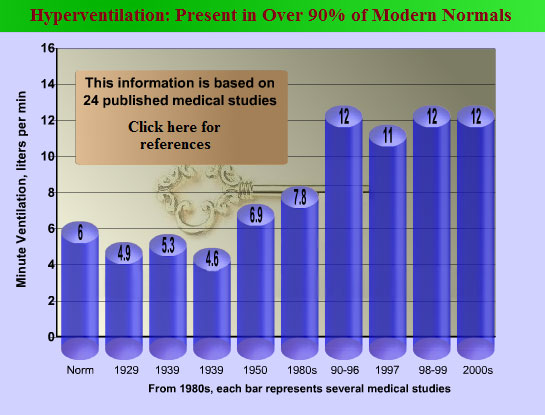 Average intake of air for a contemporary adult is about 2 times more than the medical norm. If you are interested in normal respiratory parameters (minute ventilation, tidal volume, breath frequency, etc. ), visit this section of the website: Respiration. There are many common health symptoms that relate to low body oxygenation. Most of these symptoms have a simple solution that is based on the breathing exercise that slows down breathing and increases body oxygen levels. You can find details here: Symptoms. This Section provides natural home remedies for such serious problems as blocked or stuffy nose, mucus problems, dry and wet cough, constipation, cramps, insomnia (how to fall asleep fast breathing exercise), gasping for air, sighing, and solutions to some other health concerns. Our review of Breathing Techniques analyzes various methods used by doctors, nurses, yoga teachers, and health practitioners. This Section include descriptions of sport gadgets, breathing devices, and other therapies based on manipulation of the composition of the inspired air mainly carbon dioxide and oxygen levels. For most common respiratory abnormalities in modern people, visit this section: Breathing Problems. The site is frequently updated with new pages. For our YouTube channel, you can start with this Buteyko test that measures body oxygenation and reflects health better than any other medical test. The video below is Dr. Artour Rakhimov’s Interview for Extreme Health Radio extremehealthradio.com. The title of this show was “How To Breathe For Health: Buteyko Method”. This interview is an introduction to the breathing technique that was used for most effective ever known clinical trials on asthma and cancer.